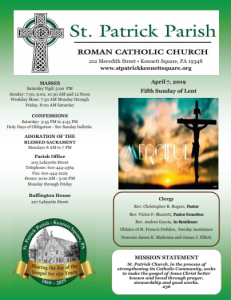 Saint Patrick Parish is excited to announce the following Jubilee Committees. These teams have planned and will manage the 150th anniversary celebrations. While there are a few different event committees, they also intertwine and support one another as needed for the various events that are planned. Are you interested in joining a committee or taking on a leadership role during the Jubilee year? If you are interested in learning more about a particular committee or the events they are planning, then simply reach out to the designated contact through the links below. The 150th Jubilee Steering Committee provides overall organization and leadership for the Jubilee. It helps the various event committees with the overall direction of the celebration, operational decisions and jubilee staff functions. It supports each team to ensure their success. The Commemorative Publication Committee manages the creation of a yearbook which will include a permanent record of the 150th Jubilee. The yearbook will include photos and reports on the Jubilee events as well as a section for family photos of St. Patrick’s parishioners. Creation of a “time capsule” is also planned to be stored for opening during a future St. Patrick anniversary event. The Community Committee is planning a number of events meant to connect Saint Patrick parishioners with the wider Kennett Square community and beyond during the 150th anniversary celebration. The History Committee collects, shares and celebrates the many special memories and moments from the rich and vibrant history of Saint Patrick Parish that spans 150 years. Reaches out to former St. Patrick parishioners who have changed parishes but are still in the Kennett area. Plans a general St. Patrick School reunion in conjunction with the Homecoming event. The Liturgical Committee supports our Pastor and Parish Office Staff in organizing special liturgical celebrations that will take place throughout the Jubilee year. Also coordinates with the parish music director to plan appropriate musical accompaniment for the Jubilee liturgical events. The Social Committee provides opportunities for all St. Patrick parishioners to enjoy family and community social events during the Jubilee year to create a stronger sense of community among ourselves and, in doing so, to celebrate our rich past, vibrant present and bright future ahead. The Youth and Family Committee organizes opportunities for children, teens and their parents/guardians to engage with one another informally as the parish celebrates its 150th anniversary.